High quality hdmi cable for transferring, uncompressed digital video, audio and control functions. Fully HDMI and HDCP compliant. Supports Full HD 1080p and 2160p 4k x 2k. 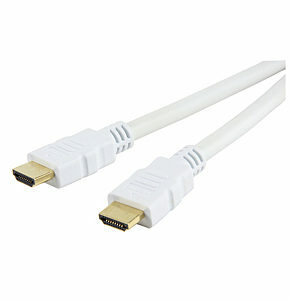 This 3 metre white hdmi to hdmi cable is ideal for connecting your HD equipment to your TV, it will provide perfect picture and sound at a bargain price, our Sharpview Gold Series range of white HDMI and digital leads produce perfect pictures at discount prices. All cables are RoHS and CE compliant. 2x4 HDMI Matrix Switch 2 In 4 Out Splitter / Switch Allows either of 2 HDMI input devices to be routed to 4 ouputs independently. Connections: 2x input HDMI female 4x Output HDMI female Full HD 1080P. Resolution: Supports 4K x 2K and 3D High performance up to 3.4 GBps/340 MHz. HDCP 1.4 support EDID function to set a fixed resolution for all connected TVs LED indication - power - elected channel & port. Selection by remote control or manual. Power: 5V Brand: Konig The 2x4 HDMI matrix switch allows you to send either of the 2 input signals to 4 TVs, each output is individually selectable to watch input 1 or input 2. Scart to HDMI Converter, supports RGB, CVBS and Audio to HDMI. Scart input to HDMI ouput Converts RGB, or Composite Video CVBS via scart to HDMI. Input connectors, 1 x scart socket. HDMI output connector. Fixed 720p output resolution. NTSC & PAL Compatible. Simple plug and play, no settings to adjust. Power supply included. 7.5m HDMI Cable with Swivel Head Connectors. Supports 3D over HDMI, 3DTV, Sky 3D and 3D Blu Ray. Supports 720p, 1080i, 1080p, 2160p and UHD 4k x 2k (4096 x 2160). Supports HDMI 1.4 and HDMI 2.0 equipment functions; ethernet channel, ethernet via HDMI and audio return channel to send audio back from a display to source. Supports extended colour spaces eg x.v.colour. 99.99% Pure OFC copper cable. 24k Gold plated 19 pin HDMI A male connectors. Metal shelled swivel connectors provide enhanced shielding and easy installation in tight spaces. Ferrite supressors reduce the risk of interference. 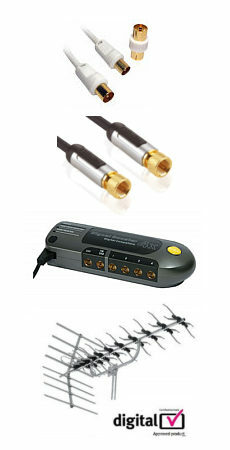 Mylar backed foil shielded oxygen free copper twisted pairs for high speed HDMI. Backward compatible with HDMI 1.0, 1.1, 1.2 and 1.3. Ideal for connecting 3DTV, Sky 3D, 3D Blu Ray, PS3, PS4, XBox 360, XBox One, Blu Ray DVD, Sky HD, DVD Recorders, Virgin Media HD, Freesat HD etc. Length 7.5 metre.